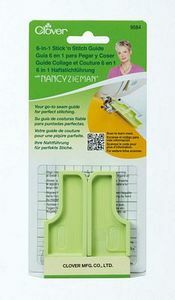 Clover 6-in-1 Stick 'n Stitch Guide by Nancy Zieman. Your go to seam guide for perfect stitching, this stitch guide is repositionable and reusable. One super-thin plastic stitch guide with grid marks for common seam allowances (1/4", 3/8", 1/2", 5/8", 3/4", 1", 1-1/4", and 1-1/2"). 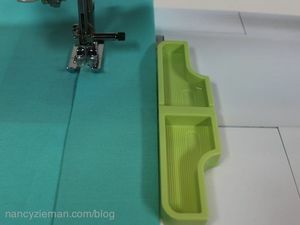 Position your machine needle for the correct seam width by aligning it along a grid line. 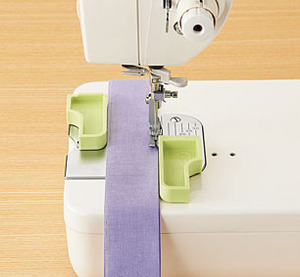 Two-piece interlocking plastic guides that allow your fabric to line up correctly with the needle. Both guides have a thin adhesive on their underside. Both can be removed, reused, and repositioned as required for your various projects. Use one shape or interlock them for a longer fabric guide—especially helpful for curtain hems. Clover 6-in-1 Stick & Stitch Tool | Serger Tip Clip 26. Perfect for managing or joining the edges of narrow fabric strips. I used the Clover 6-in-1 Stick & Stitch tool to serge the edges of my binding strip together for the Vanishing Binding technique on my new pattern Triangulate The Tee. Nancy Zieman's 6-in-1 Stick 'n Stitch Guide is your go-to seam guide for perfect stitching. Learn about everything you can do with it! 6-in-1 Stick 'n Stitch Guide/ Nancy Zieman/new sewing notion | Nancy Zieman Blog-NEED and WANT this! !